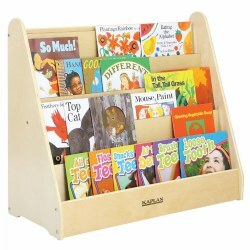 Kaplan provides easy access book displays that will help keep children organized. 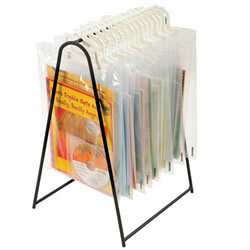 Products include large and double-sided displays for book storage. 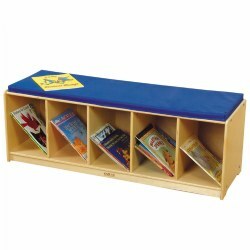 Kaplan also offers book display benches, reading tubs, and clear pocket book displays. Five roomy shelves make it easy for children to see book titles. Fully rounded Baltic birch edges, solid masonite back. Durable UV finish. 28"H x 24"W x 15"D. Wt. 24 1/2 lbs. Easy to clean, durable UV-protective finish. Fully rounded, child-safe corners and edges. FSC certified. Books not included. Five deep sloping shelves on each side store books for easy access. Unit has casters for mobility. Some assembly required. 30"H x 23 3/4" W x 24"D. Books not included. Book center holds books and materials on four sides! Two sides have display shelves, two have deep shelves for extra storage. 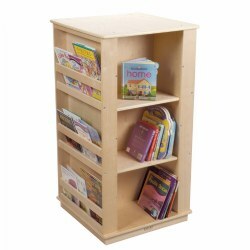 Attractive birch construction with beveled edges and a non-toxic finish make this bookshelf safe and strong. Dual-wheel nylon casters. Minor assembly, casters only. 43"H x 23 1/2"W x 23 1/2"D. 61 lbs. Books not included. Storage sections in this dual-purpose unit hold the biggest of big books. 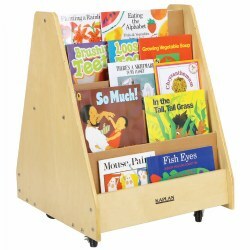 A pop-up easel displays books for viewing. The shelf below provides extra storage. Whiteboard front allows drawing and writing practice. Constructed of birch plywood with heavy-duty casters. 29"H x 24 1/2"W x 16"D. Books not included. Children will enjoy sitting on the bench with the 5 compartment built-in storage under the seat. 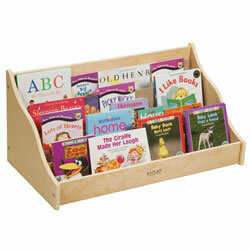 The classic design keeps books neat and organized. Great to use as a learning center divider. (Bench cushion sold separately). Fully assembled 16"H x 48"W x 15"D.
36" width allows book display to be used independently or as a room divider. Baltic birch construction with a dry erase back. 30"H x 36"W x 15"D. Wt. 40 lbs. Books not included. 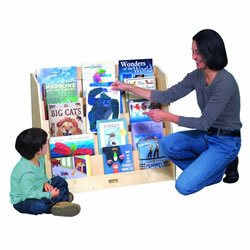 Four sided book cube provides easy access to books (including big books) and manipulatives. 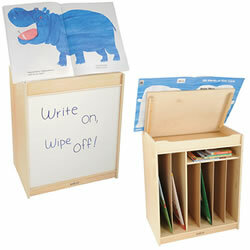 Includes 2 sides for books and 2 sides for storage. Fully assembled. Measures 30"H x 24"W x 24"D. Bins sold separately. Contents not included. Easy book access for tots on the move. Deep shelves hold cloth, vinyl and board books, allowing the titles to be seen clearly. 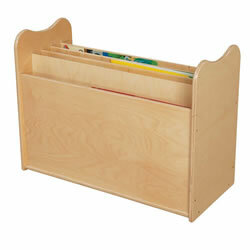 Constructed from birch plywood with fully - rounded edges for child safety. 14"H x 30"W x 15"D. Books not included. 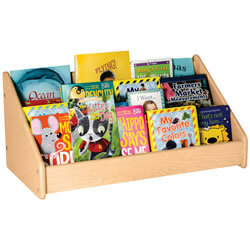 Display books within easy reach for little ones to choose their favorite topic. Double-sided bin with see-thru panels and a carrying handle for easy mobility. This book bin matches our Carolina Line of furniture perfectly. Fully assembled. Measures 10"H x 16"W x 15"D. Books not included. 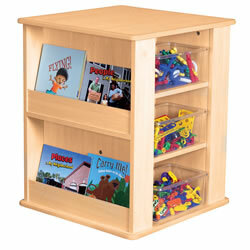 Toddlers love getting their own books and this easy access book display allows them to become independent readers. Deep shelves hold cloth, vinyl and board books. Fully assembled. 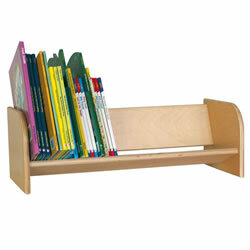 Measures 14"H x 30 1/2"W x15 1/2"D.
The intentional design of thiese shelves allow for optimal front cover display. The ease of locating an old favorite or new title will appeal to children's visual nature and draw them into the enriching world of literature. 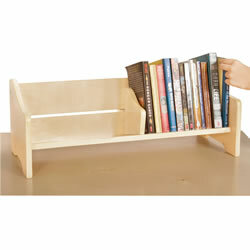 The depth of the shelves supports easy removal and replacement of reading materials. Three sizes to choose from. Books not included. 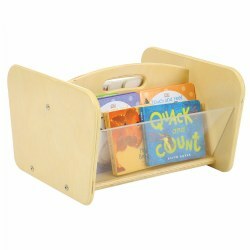 Handy storage for all books with this easy to carry book rack. Can hold up to 30 storage bags. 19"x 12 3/4". Bags sold separately (item # 47597). Books are not included.. Comfortable and cozy reading corner allows children to easily access books and have quiet conversations with their friends. The two shelf bookcase allows books to be seen easily and are deep enough to have two rows of books for each shelf. The clear side panels give the provider visibility as well as allows the children to see out. Assembly required sized 40.5"L x 47"W x 34.5"H. Cushion and pillow sold separately, item #71258. 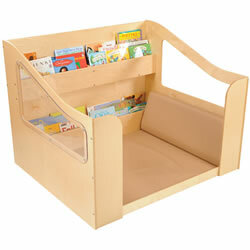 Children will enjoy sitting on this book bench with the 5 compartment built-in storage under the seat. The classic design keeps books neat and organized. Great to use as a learning center divider. Includes a 1" thick doe-colored cushion for comfort. Books not included. Measures: 16"H x 48"W x 15"D. Fully assembled. 12 months & up. 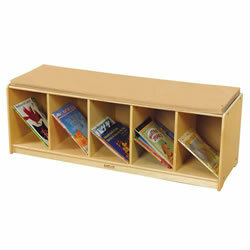 This natural tabletop book browser allows students to easily access books from a tabletop or shelf top. Measures 24" W x 10" D x 8.5" H. Adult assembly required. Is great forstorage and browsing of your favorite books. 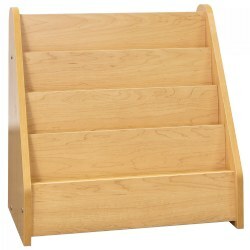 Fashioned from birch, features five shelves and durable finish. Smooth UV finish. Measures 36" W x 15" D x 30" H. Books pictured not included. Adult assembly required. 12 months & up. 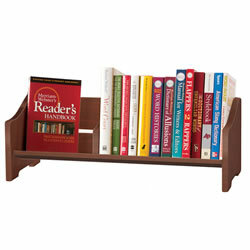 This cherry tabletop book browser allows students to easily access books from a tabletop or shelf top. Measures 24" W x 10" D x 8.5" H. Adult assembly required. 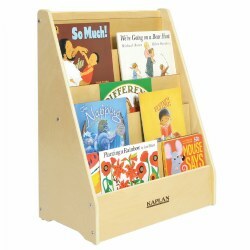 Tall books fit neatly in this handy book display so that children and teachers can find the right book every time. Can be used standing upright, with or without casters. Made with 100% Healthy Kids™ Plywood and the exclusive Tuff-Gloss™ UV finish. 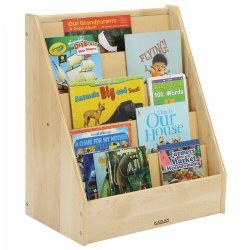 Dimensions: 23"H x 30"W x 14"D.
The overlapping shelves make it easy for toddlers to see and reach the books. The 4 shelves hold lots of books in various sizes. Fully assembled. 23"H x 24 1/4"W x 11 3/4"D. Books not included. Compact and durable desktop rack with a simple design and an economical price. Made with 100% Healthy Kids™ Plywood and the exclusive Tuff-Gloss™ UV finish. Dimensions: 8"H x 24"W x 10"D.